By faith Abel offered to God a more excellent sacrifice than Cain, through which he obtained witness that he was righteous, God testifying of his gifts; and through it he being dead still speaks. By faith Enoch was taken away so that he did not see death, “and was not found, because God had taken him”; for before he was taken he had this testimony, that he pleased God. But without faith it is impossible to please Him, for he who comes to God must believe that He is, and that He is a rewarder of those who diligently seek Him. “Now the Amalekites and the Canaanites dwell in the valley; tomorrow turn and move out into the wilderness by the Way of the Red Sea.” And the LORD spoke to Moses and Aaron, saying, “How long shall I bear with this evil congregation who complain against Me? I have heard the complaints which the children of Israel make against Me. “Say to them, ‘As I live,’ says the LORD, ‘just as you have spoken in My hearing, so I will do to you: ‘The carcasses of you who have complained against Me shall fall in this wilderness, all of you who were numbered, according to your entire number, from twenty years old and above. ‘Except for Caleb the son of Jephunneh and Joshua the son of Nun, you shall by no means enter the land which I swore I would make you dwell in. ‘But your little ones, whom you said would be victims, I will bring in, and they shall know the land which you have despised. ‘But as for you, your carcasses shall fall in this wilderness. ‘And your sons shall be shepherds in the wilderness forty years, and bear the brunt of your infidelity, until your carcasses are consumed in the wilderness. ‘According to the number of the days in which you spied out the land, forty days, for each day you shall bear your guilt one year, namely forty years, and you shall know My rejection. Now the men whom Moses sent to spy out the land, who returned and made all the congregation complain against him by bringing a bad report of the land, those very men who brought the evil report about the land, died by the plague before the LORD. But Joshua the son of Nun and Caleb the son of Jephunneh remained alive, of the men who went to spy out the land. And Moses said, “Now why do you transgress the command of the LORD? For this will not succeed. “Do not go up, lest you be defeated by your enemies, for the LORD is not among you. “For the Amalekites and the Canaanites are there before you, and you shall fall by the sword; because you have turned away from the LORD, the LORD will not be with you.” But they presumed to go up to the mountaintop; nevertheless, neither the ark of the covenant of the LORD nor Moses departed from the camp. The children of Israel rebelled and refused to listen to the LORD when He told them to go in and possess the Promised Land. As a matter of fact they believed the cowardly and unbelieving spies rather than Joshua and Caleb. They took up stones to stone Joshua and Caleb and brought the glory of the Lord to come down. The Lord would have destroyed all of them had not Moses interceded for them that God would forgive them. So God forgave them and granted them their stated desire to die in the wilderness of their own choosing. But the children of Israel presumed to go up to the mountaintop; nevertheless, neither the ark of the covenant of the LORD nor Moses departed from the camp. As a result the Amalekites and the Canaanites who dwelt in that mountain came down and attacked them, and drove them back as far as Hormah. The children of Israel did not use their faith to please and obey God the first time and would suffer the consequences of their sin and disobedience. The second time they substituted reason and presumption for faith and still did not obey God but went up to the mountain top to fight the Amalekites and the Canaanites, not believing, that the LORD, was not with them because they had turned away from the LORD. So they were defeated and fell by the sword before their enemies. These kind of things do happened in life when men base their decisions and actions on reason and presumption rather than faith and obedience! By faith the walls of Jericho fell down after they were encircled for seven days. And what more shall I say? For the time would fail me to tell of Gideon and Barak and Samson and Jephthah, also of David and Samuel and the prophets: who through faith subdued kingdoms, worked righteousness, obtained promises, stopped the mouths of lions, quenched the violence of fire, escaped the edge of the sword, out of weakness were made strong, became valiant in battle, turned to flight the armies of the aliens. Women received their dead raised to life again. And others were tortured, not accepting deliverance, that they might obtain a better resurrection. Still others had trial of mockings and scourgings, yes, and of chains and imprisonment. They were stoned, they were sawn in two, were tempted, were slain with the sword. They wandered about in sheepskins and goatskins, being destitute, afflicted, tormented- of whom the world was not worthy. They wandered in deserts and mountains, in dens and caves of the earth. This entry was posted in WALTER'S WEB and tagged christianity, FAITH, FAITH IS, FULL GOSPEL, GIFTS OF THE SPIRIT, HEALING, HOLY SPIRIT, JESUS CHRIST, MIRACLES, PROSPERITY, VICTORY, VICTORY MINISTRIES, WALTER KAMBULOW, WORD OF FAITH on October 31, 2015 by WALTHOPE. Heavenly Father by Your divine holy authority, I take dominion and authority over every spirit of infirmity. I nullify every wicked dart of sickness and illness that the enemy can possibility use to attack me in any form or shape. I decree and declare that no weapon of sickness or illnesses fashioned or formed against me by any spirit of infirmity shall prosper. I destroy every sickness plan the enemy can possibility have against me and I reduce it all to nothing! 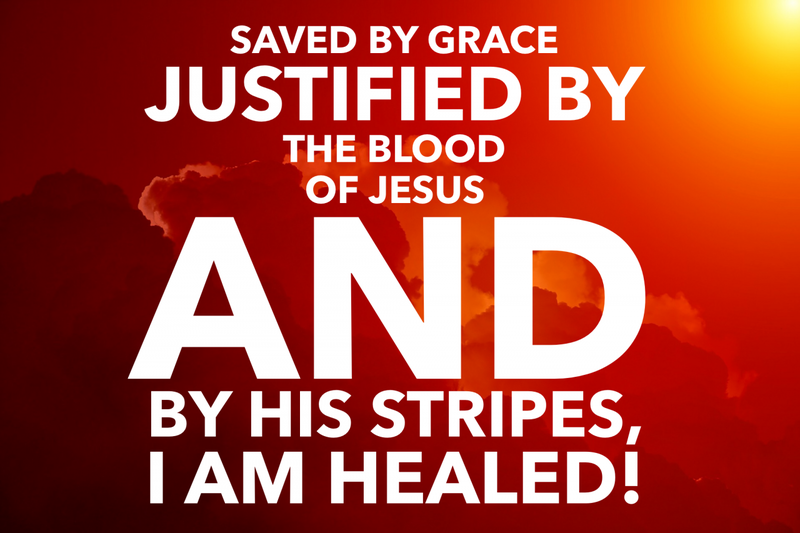 In the mighty name of Jesus, I declare that the LORD Jesus is my Healer and by His holy stripes, I am totally healed. I soak myself in the atonement blood of Jesus and I cancel every general illness plan upon my life. I engulf the camp of infirmity spirits with Holy Ghost fire. I consume every power of illness with the fire of the Holy Ghost, and I render every satanic sickness power the occult can possibly use against me useless. I rebuke every spiritual foundation of sickness and I command every infirmities spirit to bow right now to the authority that is in the name of Jesus Christ. I decree that it is perfectly well with my soul, and I decree that my entire being shall manifest the healing power of the LORD Jesus in all aspects of my existence. I declare that the blood of Jesus is against every spirit of sickness ( and other demonic spirit) that can possibility try to attack me. I say with confidence that I am the healed and redeemed of the LORD and by the precious blood of the Lamb, it shall continue to be well with me. I release the judgement fire of the Holy Ghost upon every stubborn spirit of sickness and illnesses and demonic spirit. I confess and declare that total healing has taken place by the blood of Jesus in all aspects of my life, and I forbid by the authority of the Holy Ghost any reoccurrence of sickness or demonic spirit in my life. I cover myself with the atonement blood of Jesus, and I declare that I carry the mark of Christ therefore, let no infirmities spirits or demonic spirit ever trouble me! In Jesus holy name and by His righteous authority I have decreed and declared! Amen. NOTE: There are other demonic spirits besides the spirit of infirmity that create havoc in the life of believers which can be named, rebuked and taken authority over by this prayer. Demonic spirits such as lust, poverty, adultery, immorality, lying, addiction, thievery, etc! Dear heavenly Father, I give You thanks and praise for sparing my life to see another day. I rejoice in Your presence oh LORD in this day and I exalt You for renewing Your mercies upon my life daily. I commit this day into Your hands. I pray You will keep me in Your Holy Spirit presence as I come and go. Clear my path oh LORD from every obstacles. Remove every evil mountains and stronghold from my path of destiny. Fill me up oh LORD with Your knowledge and wisdom. Order my footsteps daily and let Your glorious light shine brighter upon me. Keep me in Your righteous path. Honour Yourself in me daily oh LORD my God. Count me always amongst your redeemed living souls. And keep me daily in perfect steadfast walk with You. Increase my faith, hope and trust in You and keep me far away from every unholy and ungodly associations. Bless me daily oh LORD with Your divine attributes of patience. Help me to discern right from wrong and enable me to always choose right between right and wrong. Open wider the eyes of my understanding and save me from erroneous judgements and from wrong conclusions. Counsel me daily with Your holy counsel and let Your counsel always guide my conscience and let it always be the only source for my decision making in life. Help me to serve You daily in righteousness diligence and in good faith. Increase Your authority and boldness in me so I can without fear declare Your truth across the earth. Consume the spirits of fear with Your judgement fire and destroy every plan of the enemy to cripple me with fear. Watch over me daily oh LORD my God with Your watchful eyes, and as I come and go, let me remain in uprightness position with You. Let no evil spirit come near me and let no evil ever befall me. Let no evil weapon of the enemy ever prosper or work against me. Anoint my feet daily with Your holy oil and make me daily a bearer of the Gospel Good News. Encourage me oh LORD to encourage others. Enable and inspire me daily so I can be a source of inspiration and enablement for others. Provide in Your abundance for my needs and equip me financially so I can be perfectly positioned to minister to the needs of others for Your goodness name sake. Let Your joy exceedingly increase in me oh LORD my Maker. Let Your laughter fill my soul. Let Your praise fill my heart. Let the meditations of my heart please You. Let my desires be of Your holy will. Let me always honour and glorify You in all that I do oh LORD my God. Sanctify my tongue daily and make it always an instrument of righteousness and holy worship. Make me a true worshipper daily and let me always worship You in spirit and in truth. Let no corrupt conversation take place in my mind. Let no evil communication proceed forth from my mouth. Let no sorrowful thoughts form in my mind. Sanctify my lips for Your praise and purify my heart daily oh LORD to be obedient to Your divine Will and humbly recipient to Your perfect ways. Shield me from the confusion darts of the enemy. Protect my mind from the wicked suggestions of the enemy and let no subliminal messages of the evil ones gain entrance into my mind to pollute it. Help me to be obedient to You daily and protect my soul from rebellious thoughts. Increase Your holy anointing upon my life. Deliver me from all evil and lead me not into temptations. Guard and shield my heart, my soul, body, spirit and mind oh LORD with Your whole armoured shield. Have Your perfect way in me always oh LORD my God and faithful Redeemer. Open the floodgates of heaven and pour Your blessings generously daily upon me. Let Your anointing rain of power fall upon me non stop and let me always operate and function in the overflow of Your anointing power. Focus my attention on You daily oh LORD my Christ. Make a way for me daily my LORD where there seem to be no way. Perfect my ways daily and let Your joy continually be my strength oh LORD my God. Let Your blessings in my life in this day and for the rest of my life be permanent oh King of glory! Let Your grace and mercies continually rest and abide with me now and for ever. In Jesus mighty name I have prayed. Amen. This entry was posted in WALTER'S WEB and tagged DELIEVERANCE, FAITH, FULL GOSPEL, HEALING, HOLY SPIRIT, JESUS CHRIST, Prayer Against Sicknesses, VICTORY, VICTORY MINISTRIES, WALTER KAMBULOW, WORD OF FAITH on October 30, 2015 by WALTHOPE. Tribulations exist because there is a battle between the kingdom of God and the kingdom of the devil. When we operate in faith, God is able to grant us such victory that we are actually better off because of the battle. It’s just like when a army goes to war. If they win, they gain spoils. But if they embrace their enemy because of the spoils they were expecting to receive, they will be killed instead of blessed. First, you have to fight and win the war and then, and only then, will the spoils be available. The enemy doesn’t come to be a blessing, but a blessing can be obtained from the enemy if we are victorious. If problems were what perfected us, then most Christians would have been perfected long ago and those who experienced the greatest problems would be the greatest Christians. However, that’s not the way it is. God’s Word is given to us to make us perfect, and thoroughly furnished unto every good work (2 Tim. 3:17). God’s Word does not need to be supplemented with problems to accomplish its work. God is love. He is perfect, and His love for us is perfect. There is nothing you can do right now to make God love you more, and there’s nothing you can do to make Him love you any less. His love toward you is steadfast; it’s unchanging. His arms are always stretched out toward you. He’s always ready for you to come to Him. Sometimes people aren’t sure how God feels about them. They think He might be mad at them, but Scripture tells us just the opposite. God’s not mad at you; He’s madly in love with you! It doesn’t matter what you’ve done or where you’ve come from, God’s arms are open to you. He’s longing to show you His goodness and grace. Today, meditate on the truth that it is His kindness that leads us to repent and change our ways. Open your heart and receive His love. Let it give you confidence and make you new. Trust His perfect love and let Him transform every area of your life! (1) When fleeing the wrath of King Saul, he sought the help of a certain priest—a decision that caused Saul to order the death of eighty–five priests and their families. Devastated but not defensive, David told the surviving son of the slain priest who had assisted him, ‘…I have caused the death of all your father’s family.’ (1 Samuel 22:22 NLT) Can you imagine taking responsibility for such a tragic consequence? Leviticus 1:6 – And he shall skin the burnt offering and cut it into its pieces. Do you know who first clothed man with coats of skin? It was God Almighty Himself, when He found Adam and Eve hiding behind the bushes because they were afraid of Him. They had become fearful and conscious that they had sinned against God. In their sin-consciousness, they realized that they were naked and that the glory of God, which had been their covering, was gone. So God killed an animal to clothe Adam and Eve with coats of skin. (Genesis 3:21) An animal had to die and its bloodied skin became their covering. This speaks of the blood of Jesus that covers you when He became your burnt offering. The Lamb of God did not just take away your sins. He also gave you His righteousness. When you believe that you are righteous because of Jesus’ blood, you will see the effects of wearing His robe of righteousness. You will see miracles happening before your very eyes. You become a blessing magnet, a favor or grace magnet. It is not your own righteousness, but the righteousness of Jesus which you have put on, that is attracting all these blessings of God into your life. My friend, have the consciousness of being clothed with Jesus’ robe of righteousness. Every day, come to God and say, “Father, I thank You that Jesus is my burnt offering. He covers me from head to toe with His righteousness. What He is to You, I am. As He is now, so am I. I am in Him.” And you will see the manifestations of the blessings of health, wholeness, protection and provision that the robe attracts! As a child of the Most High God, your steps are ordered by Him. He has a specific place of blessing prepared for you. When you live a life of obedience to the Word of God, He promises to supply every one of your needs. Just as God directed Elijah to his place of blessing, God is directing you, too. He’s aligning the right opportunities for you and causing the right people to come along your path to help you. He’s constantly working behind the scenes. But in order to get to that place of blessing, you have to do your part to keep your heart open and stay in step with Him. A major key to keeping your heart in the right place is choosing peace and unity in Christ. The Bible says that when we live in unity, there He has commanded the blessing. When your heart is in the place of blessing, then the rest of your life will be in the place of blessing, too! This entry was posted in WALTER'S WEB and tagged christianity, FAITH, FULL GOSPEL, HOLY SPIRIT, JESUS CHRIST, MIRACLES, PERFECT LOVE, PROSPERITY, THE KINGDOM OF GOD, VICTORY, VICTORY MINISTRIES, WALTER KAMBULOW, WORD OF FAITH on October 30, 2015 by WALTHOPE. Jesus Christ alone is the way, the truth and the life and no one comes to the Father but by Him. But deceivement is a real problem for many Christians because they go off tangents and worship a truth or a man who brought them the truth. However, we are not to worship no one or nothing but God, and God alone. As we have therefore received Christ Jesus the Lord, so we are to walk in Him, rooted and built up in Him and established in the faith. We are not to allow anyone to cheat us through philosophy and empty deceit, according to the tradition and ideas of men, according to the basic principles of the world, and not according to Christ. 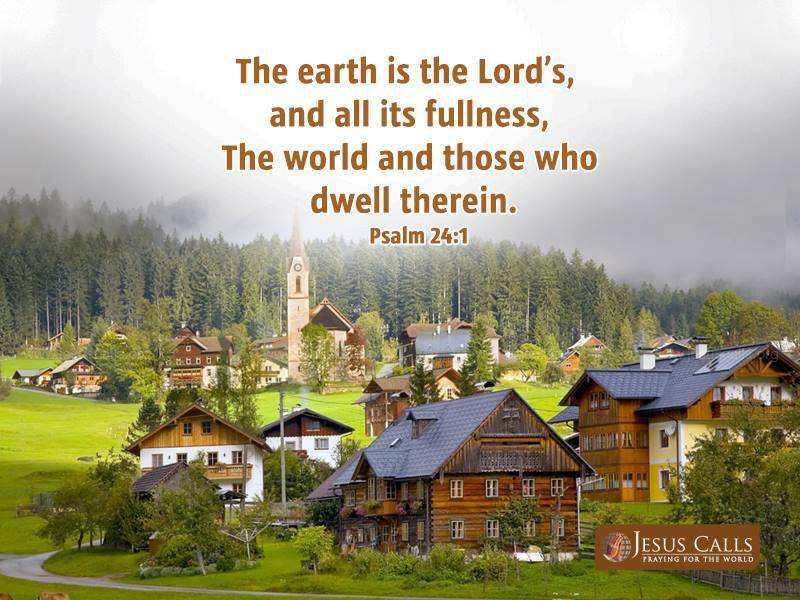 For in Him alone dwells all the fullness of the Godhead bodily and He has the answers to every problem that we face! “Under the law of nature, all men are born free, every one comes into the world with a right to his own person, which includes the liberty of moving and using it at his own will. This is what is called personal liberty, and is given him by the Author of nature, because necessary for his own sustenance.” –Thomas Jefferson: Legal Argument, 1770. The harmony of life is based on One’s understanding of who your Creator is. He is not a thing out there, He is a Person and He has feelings. Your relationship with Him is not like any other relationship you have experienced in this Universe. He is both sensitive and rational. He is warm and tender, yet wise and full of judgment. He is both caring and ready to do justice. He loves to be loving and compassionate, but if He must, He will be judgmental and assertive. He is all things to all men that some may be won to His Kingdom, but He will not compromise His values and position to avoid doing what is an unpleasant thing. He does not try to avoid the unpleasant. If you arouse His anger enough He can become very angry. If you do what is wrong, you will be punished, in this He is unflinching. He is the great Creator and He will not be moved by men’s moods, attitudes or black-mail. He will only be moved by faith and a deep trust in Him. Yes, God does have His timing and His choosing and His ways. He does not necessarily fit into people’s perception of Him. They think He is only a God of love, mercy and grace but He is also a God of judgment. He forgives but He also brings the consequences of people’s behavior upon themselves. He even brings it upon their children to the third and fourth generation. Many think that He is a liberal God but He is not a liberal. Some think He is a republican God but He is not a republican. He is the LORD of this universe and what He says goes! Men can think as they please, they can do as they please and they can go where they please. But if what they think and do, does not please Him they have missed Him and the consequences of their actions will be exacted from them. For He is a person of great price! He demands their all! He demands their hearts! He demands their souls raised to Him! No, He doesn’t ask little He asks all for He is the Great I AM! Those who persist in doing things their own way will eventually pay a terrible price for it. Though it may appear that no price has been paid, looks can be deceiving. We as men, love to deceive ourselves that all is well with us and wrong with everyone else while we betray God and is calling for our lives. We forget that we have to have an intimate relationship with Him that transcends all our desires, plans, purposes and goals in life. If our goals and plans are totally submitted to Him, we can expect He will probably change them for the better if we just trust Him. He is in a far better position to guide us into a deeper more meaningful life than we could ever think up on our own. He is able to do what we could never think out or dream of. He is able to deal with our out of control inner man who only wants things for self. He is able to set our compass straight and chart the right kind of course for our life. He is just the kind of God. He loves us so much. But, we must give Him a chance. Not for a week or a year but for a lifetime. If we don’t we’re the losers and so is He because He loves us so much He will lose the love He desired from us. Our place in the Kingdom will be empty because only we can fill that place. His is able to lead us to the special place just for us in the Kingdom but we have to follow Him with great fidelity and respect. He is able, not because we say so in words, but because in His own strength and power He is truly able to lead us out of our Armageddon into the Promised Land! The choice is ours. Do we really want Him at all costs, or do we want our own way and our own desires because without Him we are not going to make it no matter what the world says. The world is not making it without Him despite how they act and what they say. They may appear to be very successful in terms of worldly success but that has nothing to do with real spiritual success. It doesn’t mean we should not try to be financially accountable and successful in the world, but it should not be our priority. The Lord should be our priority. As we lean on Him and do what He has called us to do we will be both spiritually and carnally successful. If we are not successful we have to look to the Lord to show us why, so we can turn it over to Him to change with the understanding we can’t change ourselves only He can. Our relationship with Him is based on a mutual trust. We trust Him to change us, He trusts us to remain faithful and true to Him. This cycle of success breeds more success until we begin to see one victory after another in our life. Then, this cycle of success breeds a lifestyle of success until we are truly more than conquerors through Christ Jesus and can now lead others into this right kind of lifestyle in Him. This is true success! What more can you ask except to know you are in harmony with your Lord and Savior and the world around you. There can be no greater satisfaction than this. That we have helped others toward the right kind of life that will bring them health and freedom to be themselves and in turn love those around them. A world set free from sin and death there can be no better victory! Imagine a world walking in the victory Jesus Christ provides. People free from emotional upheavals, depression, despair and grief. People genuinely happy to see each other and love one another helping one another when needed. Open to the Commandments God has given them to follow. Doing it out of the gladness of their yielded hearts. Doing the will of the Father with all of their soul and very being. Avoiding backbiting, gossip, slander, evil speaking and all other forms of nasty qualities such as envy, jealousy, cowardice, selfishness, anger, rage, strife, rejection, pride, arrogance and many other such evil behavior. All of it is not of Him. He is the author and finisher of our faith and we need to take all of our faults, flaws and problems to Him and He will give the power to overcome because He is able. How often we have come across carnal Christians who have not given their sinful nature over to God and witnessed the devastating results in churches and para-organizations world over. We need Jesus. We need the Spirit of Jesus in Christians today. We need to get on our knees and stop looking to our neighbor. Yes, they have their problems but so do you. Look not on the speck in your brother’s eye before you care for the beam in your own eye. Take care of that beam first then gently remove the speck in you brother’s eye. Gently, beloved! Not roughly, cruelly or without regard for the destruction of your manner. Love is the rule. We all respond to love even when we don’t appear to. We all need it. We’d rather scrape and fight for it than admit we need it, so we scrape and fight and wonder why no one loves us. It’s because we are going about it the wrong way. If we knew we were loved unconditionally we would yield if we’re smart. If that is our true goal? If not, even our wrong motives will be revealed and we will be exposed to God and man. No one gets away with their behavior and wrong motivations! God is no fool. He knows us intimately. He loves us purely. He defends His own when they surrender and become humble before Him and others. He is the greatest forgiver on this entire planet. No one escapes His piercing glaze. It is we who must swallow our pride and admit we are wrong! Ouch! That hurts! Wrong! Ouch! This entry was posted in WALTER'S WEB and tagged christianity, FAITH, FULL GOSPEL, GIFTS OF THE SPIRIT, HEALING, HOLY SPIRIT, JESUS CHRIST, MIRACLES, PROSPERITY, THE PROMISE, VICTORY, VICTORY MINISTRIES, WALTER KAMBULOW, WORD OF FAITH on October 28, 2015 by WALTHOPE. John 10:10 – …I [Jesus] have come that they may have life, and that they may have it more abundantly. Though Jesus is completely God, He was born completely human. He went through temptation after temptation and conquered every one of them. 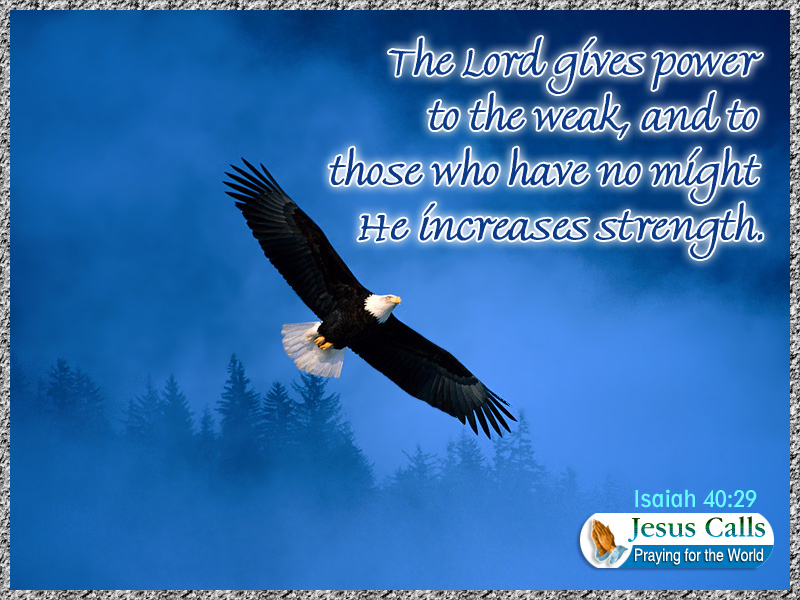 (Hebrews 4:15) And all that overcoming power is found in His life. And He put that life in you—the life of Christ is in you! During Jesus’ ministry on earth, He conquered sickness, the winds and waves, the powers of darkness and death. It is His life that brings victory over the devil and all his works. And He put that life in you—the life of Christ is in you! Finally, Jesus went to the cross. And that life in Him put an end to everything that was natural of the Adamic race—sickness, poverty, failures, pains, curses and death. All that was natural ceased to be in that life of His. But all that was supernatural remained in Him. And He put that life in you—the life of Christ is in you! Then, Jesus rose from the dead. And in that life of His was added the power of resurrection. And He put that life in you—the life of Christ is in you! After His resurrection, Jesus went back to heaven to His Father. Today, He is seated at the right hand of God, resting in His finished work, occupying a place of the highest authority. And He put that life in you—the life of Christ is in you! God cares about you too much to leave you in any doubt about His love. The Bible says His ‘perfect love expels all fear.’ If God loved us with an imperfect love, we’d have cause to worry. Human love is flawed; it keeps a checklist of our sins and shortcomings—and consults it often. God keeps no such list. His love casts out our fear because it casts out our guilt. John writes, ‘…if our heart condemns us, God is greater than our heart…’ (1 John 3:20 NKJV) When you feel unforgiven, question your feelings but don’t question God. Go back to His Word; it outranks self–criticism and self–doubt. Nothing fosters confidence like a clear grasp of God’s grace, and nothing fosters fear like ignorance of it. The fact is if you haven’t accepted God’s grace, you’re doomed to live in fear. No pill, pep talk, psychiatrist or earthly possession can put your mind at ease. Those things may help numb your fear, but they can’t eradicate it. Only God’s grace can do that. Have you accepted Christ’s forgiveness? If not, get down on your knees and do it now. The Bible says, ‘If we confess our sins, He is faithful and just to forgive us…and to cleanse us from all unrighteousness.’ (1 John 1:9 NKJV) The place of confession is also the place of cleansing and restored confidence towards God. Your prayer can be as simple as this: ‘Lord, I admit I’ve turned away from You. Please forgive me. I place my soul in Your hands and my trust in Your grace. In Jesus’ name I pray. Amen.’ Now, having received God’s forgiveness, mercy and grace—live like it! I heard the saddest words today. Two believers in Christ were discussing an issue about which they had differing opinions. The older of the two seemed smug as he wielded Scripture like a weapon, chopping away at the things he saw as wrong in the other’s life. The younger man just seemed weary of the lecture, weary of the other person, and discouraged. Had this been said to me, I thought, I would have been devastated. In that moment I knew the Holy Spirit was telling me there had been people I had missed the chance to love. And I knew there were people who couldn’t see Jesus in me either. The apostle Paul tells us that love must be the underlying motive in anything we do; in everything we do (1 Cor. 13:1-4). Let’s not miss the next chance to show love. Love beats lectures every time. We should not think it is strange to be persecuted. “All that will live godly in Christ Jesus shall suffer persecution” (2 Tim. 3:12). We can actually rejoice because we are being persecuted for Jesus’ sake, and the Lord will be with us in the midst of the persecution. When we stand before Him, there will be more than ample reward. Persecution is a token that those persecuting you are under conviction. They realize that they are not living what your words or actions are advocating and in self defense, they attack you, who they perceive is the source of their conviction. If you understand this, it makes persecution much easier to take. They aren’t just mad at you; they are convicted. When the gospel is presented in the power of the Holy Spirit, there will always be either revival or riot, but not indifference. Jesus makes it clear that persecution is an inevitable part of living a godly life, so that we will not fall prey to introspection and self-condemnation when rejection comes. If our sinless Savior was rejected, then certainly we will be too. Don’t feel guilty or condemned when persecution comes. The Word strips people of the disguises they have been hiding their sins behind, and the result is persecution. God loves you so much. He longs to bless you in every area of your life. 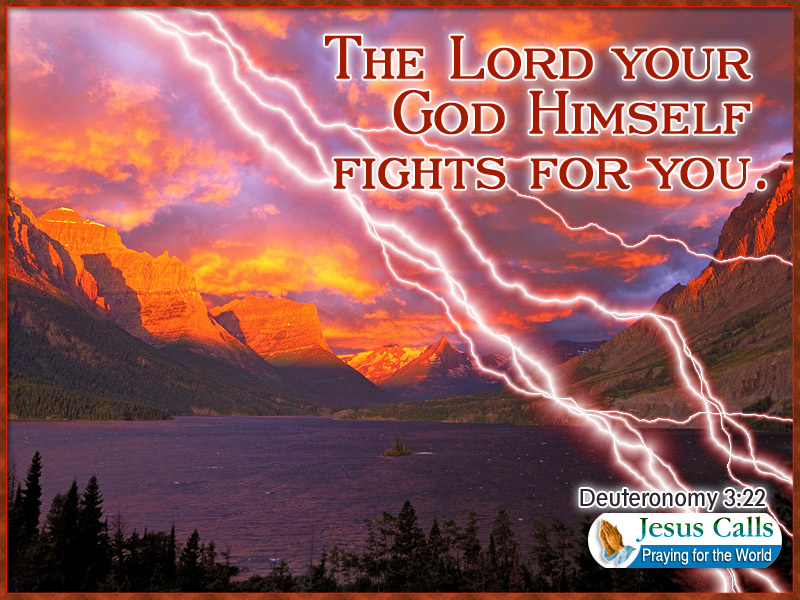 Deuteronomy says that He wants to bless you when you come in, and when you go out. 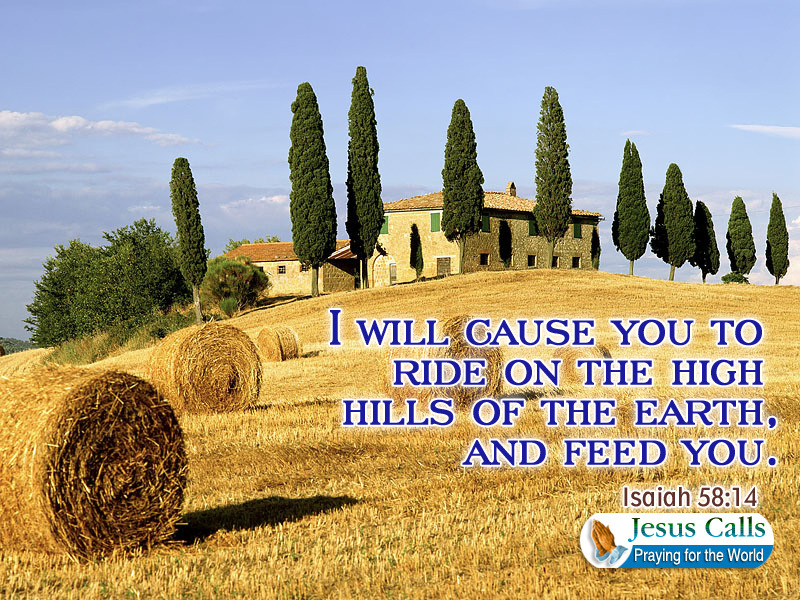 He wants to bless you when you’re in the city, and bless you when you’re in the country. He wants to bless and prosper everything you set your hand to. When you are living in peace and unity with the people in your life, you are positioning yourself for God’s blessing. Living in unity doesn’t mean you always have to agree with everyone. It means that you look for common ground in Christ and refuse to allow strife to enter into your relationships. Today, focus on the things that bring you together. Focus on your faith in God and dependence on His Word. Build one another up and watch how God will pour out His favor and blessing! Faith is simply seeing what God sees. It’s choosing God’s way even when things look differently in the natural. When you set your thoughts on higher things, like today’s verse suggests, you are looking at life through your eyes of faith and seeing what God sees. For example, you may have a financial need today, but when you look higher, you see that God promises to supply all your needs according to His riches in glory. You may have sickness in your body today, but when you look higher, you see that Jesus paid for your sickness and disease. You may feel lonely today, but when you look higher, you see that God has promised to never leave you nor forsake you. As you meditate on God’s Word, you are setting your thoughts on higher things and setting your life in the direction of the good plan He has in store for you! This entry was posted in WALTER'S WEB and tagged FAITH, FULL GOSPEL, GIFTS OF THE SPIRIT, HEALING, HOLY SPIRIT, JESUS CHRIST, MIRACLES, PROSPERITY, STRENGTH, THE KINGDOM OF GOD, VICTORY, VICTORY MINISTRIES, WALTER KAMBULOW on October 27, 2015 by WALTHOPE. Defeat of an enemy or opponent. 2. Success in a struggle against difficulties or an obstacle. 3. The state of having triumphed. “But when he came to himself, he said, ‘How many of my father’s hired servants have bread enough and to spare, and I perish with hunger! ‘I will arise and go to my father, and will say to him, “Father, I have sinned against heaven and before you, “and I am no longer worthy to be called your son. Make me like one of your hired servants.” ‘ “And he arose and came to his father. The answer was simple, he came to himself and recognized his problem. He took action and went to his father and stated he had sinned against heaven and in his sight and was no longer worthy to be called his son. He humbled himself and asked forgiveness and was ready to face the music. What did he get for his deeds? Compassion and a feast and they began to be merry. Well our Heavenly Father is more than willing to forgive those who admit their sins, turn from them and ask for his forgiveness and for the best that heaven has to offer them. The problem is that the enemy has deceived and blinded God’s people of how good God is to those of humble and contrite hearts. To those who say “I have sinned and failed you but with your help and power I am willing to change and make amends.” To such as these, heaven is wide open with blessings and riches of God Himself that men have not ever seen yet. Otherwise those who take their sins and deeds lightly and continue in their way will find themselves facing a furious king who will destroy them and their kingdom. Just like King Saul was destroyed. It might take some time but it will happen. It’s our choice we can return back to our Heavenly Father and that wonderful Holy Spirit who alone can do all the things that we cannot do or face the music? For this is the beginning of sorrows for those who have too long pretended to be God’s good shepherds. This is the beginning of the exposure of these evil men. God is here in our midst, He will move on our behalf in a spectacular way. We can not imagine what He has in store for us if we surrender. The Healing and Victory He has in store for us is only the beginning. We have to cling to Him as we would to our mother’s side when we were children. He is the breath of our life. He is the healing breath of our soul. He is the healing change of our spirit. Our road and walk with Him can be full of His blessings and healing and changes. It can be truly marvelous and spectacular. Then our good fortune will be the envy of others. But few will desire it because they don’t understand what it is to pay the price for it all. But nevertheless it’s our choices that determine the resulting consequences. ‘But now I will not treat the remnant of this people as in the former days,’ says the LORD of hosts. ‘For the seed shall be prosperous, The vine shall give its fruit, The ground shall give her increase, And the heavens shall give their dew- I will cause the remnant of this people To possess all these. And He said to them, “Which of you shall have a friend, and go to him at midnight and say to him, ‘Friend, lend me three loaves; ‘for a friend of mine has come to me on his journey, and I have nothing to set before him’; “and he will answer from within and say, ‘Do not trouble me; the door is now shut, and my children are with me in bed; I cannot rise and give to you’? “I say to you, though he will not rise and give to him because he is his friend, yet because of his persistence he will rise and give him as many as he needs. Blessed be the God and Father of our Lord Jesus Christ, the Father of mercies and God of all comfort, who comforts us in all our tribulation, that we may be able to comfort those who are in any trouble, with the comfort with which we ourselves are comforted by God. 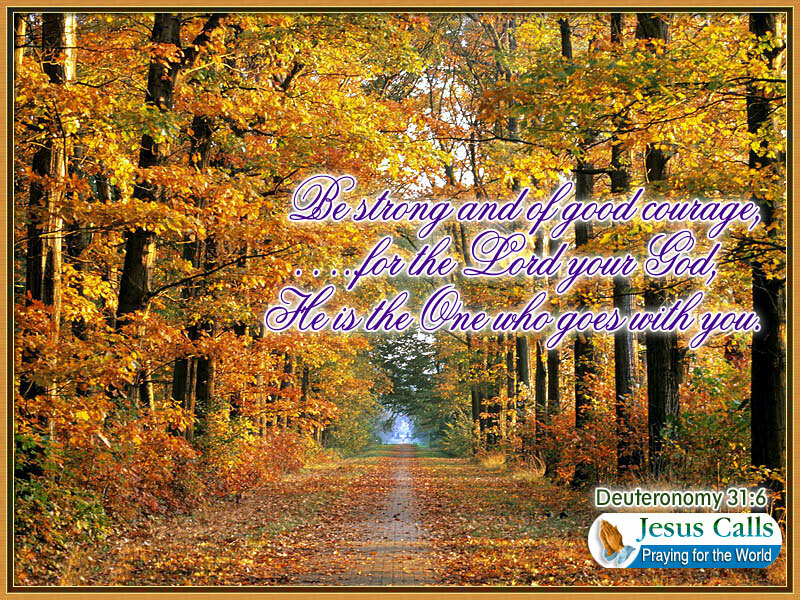 For as the sufferings of Christ abound in us, so our consolation also abounds through Christ. Now if we are afflicted, it is for your consolation and salvation, which is effective for enduring the same sufferings which we also suffer. Or if we are comforted, it is for your consolation and salvation. And our hope for you is steadfast, because we know that as you are partakers of the sufferings, so also you will partake of the consolation. Oh Holy God, we lift up the Words You have given Your Prophet. We hold on to our Faith regardless of circumstances. Oh Jesus, it is You that walks with us everyday. It is You that gives us the power to say to the mountain, be gone in the Name of Jesus. You, Jesus, are the Good Shepherd. You tend to Your sheep. You pick us up and brush us off. You hold us gently in Your arms. Help us to remember Your love. Help us to know that before we were born, all of our needs had been met through Your Bloodstained Cross. We thank You for everything You have done for us. Father God in the mighty name of Jesus we ask that you to open the windows of Heaven on our family and pour out a blessing that they can not contain as it is written. We rebuke the devourer in this family, and command the devil to give back what he has stolen from their finances, wealth and heath in Jesus name. This entry was posted in WALTER'S WEB and tagged christianity, FAITH, HEALING, HOLY SPIRIT, JESUS CHRIST, MIRACLES, PROSPERITY, VICTORY, VICTORY MINISTRIES, WALTER KAMBULOW, WORD OF FAITH on October 27, 2015 by WALTHOPE. God gives His many promises to all His people but they are not automatic nor are they accepted by all His people as seen with Joshua and Caleb who believed God while the majority did not! 26 And they came to Moses and Aaron and to all the congregation of the people of Israel in the wilderness of Paran, at Kadesh. They brought back word to them and to all the congregation, and showed them the fruit of the land. 27 And they told him, “We came to the land to which you sent us. It flows with milk and honey, and this is its fruit. 28 However, the people who dwell in the land are strong, and the cities are fortified and very large. And besides, we saw the descendants of Anak there. 32 So they brought to the people of Israel a bad report of the land that they had spied out, saying, “The land, through which we have gone to spy it out, is a land that devours its inhabitants, and all the people that we saw in it are of great height. 1 Then all the congregation raised a loud cry, and the people wept that night. 5 Then Moses and Aaron fell on their faces before all the assembly of the congregation of the people of Israel. 7 and said to all the congregation of the people of Israel, “The land, which we passed through to spy it out, is an exceedingly good land. 8 If the LORD delights in us, he will bring us into this land and give it to us, a land that flows with milk and honey. 10 Then all the congregation said to stone them with stones. But the glory of the LORD appeared at the tent of meeting to all the people of Israel. 11 And the LORD said to Moses, “How long will this people despise me? And how long will they not believe in me, in spite of all the signs that I have done among them? 23 shall see the land that I swore to give to their fathers. And none of those who despised me shall see it. 24 But my servant Caleb, because he has a different spirit and has followed me fully, I will bring into the land into which he went, and his descendants shall possess it. 33 And your children shall be shepherds in the wilderness forty years and shall suffer for your faithlessness, until the last of your dead bodies lies in the wilderness. 37 the men who brought up a bad report of the land—died by plague before the LORD. 38 Of those men who went to spy out the land, only Joshua the son of Nun and Caleb the son of Jephunneh remained alive. This entry was posted in WALTER'S WEB and tagged christianity, FAITH, FULL GOSPEL, MIRACLES, PROSPERITY, THE HIGH PLACES, VICTORY, VICTORY MINISTRIES, WALTER KAMBULOW, WORD OF FAITH on October 26, 2015 by WALTHOPE.